Hie Jinja shrine provides an oasis of nature, tranquility and traditional Japan in the midst of modern Tokyo. 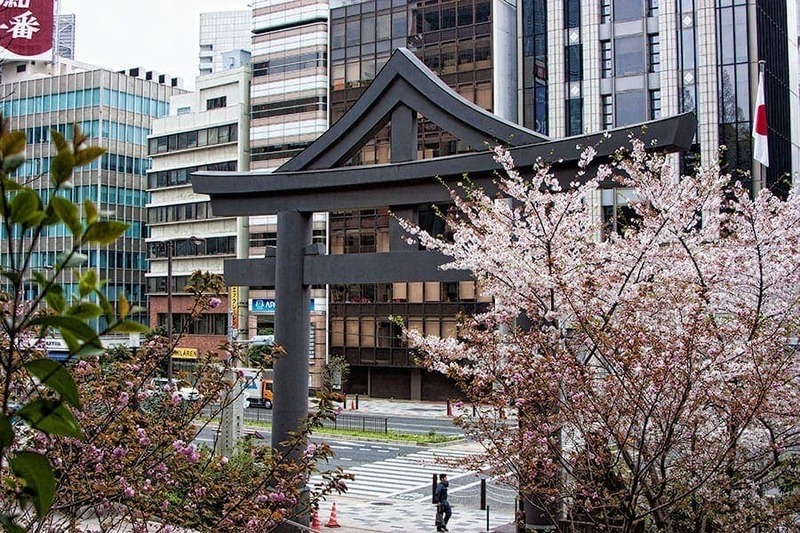 Located in Nagatcho, the Japanese seat of government, it sits amongst the sky scrappers and hubbub of the city that has grown up around it. 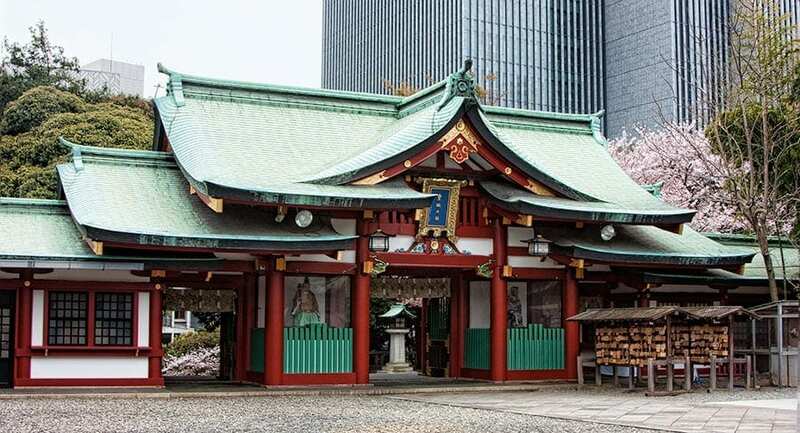 The shrine is also just a short walk from the busy Akasaka-Mitsuke subway station and the modern business district of Akasaka. 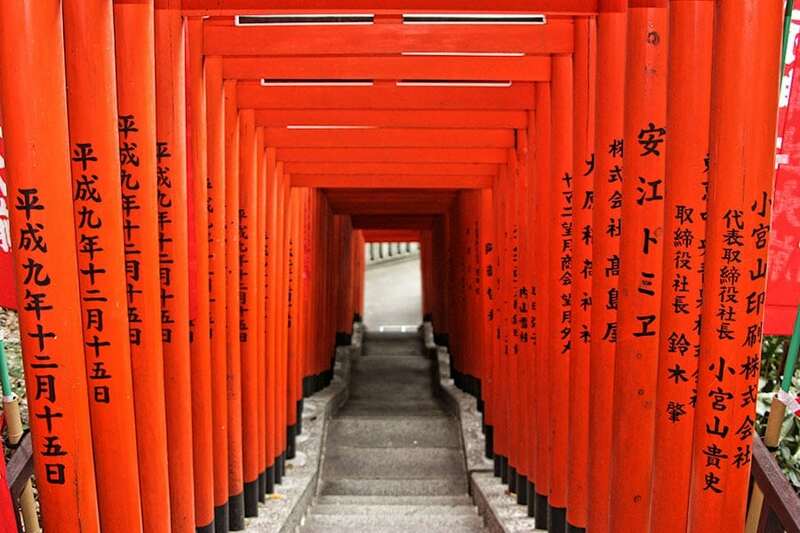 We had a bit of a wander around Akasaka after breakfast one morning and found this beautiful tunnel of tori reminiscent of the Fushimi Inari shrines walkways which felt quite traditional and I couldn’t resist a wander through. It turns out we arrived via a side entrance which is OK. You should always enter a shrine through a tori but it doesn’t have to be the front one. Had we arrived at the front we’d have got quite a different first impression. The modern concrete tori, wide steps and escalators have a very different feel. Surely this is the only shrine I’ve seen with escalators! Hie Jinja Shrine was established in 1478 and at one time stood within the grounds of Edo Castle (now the Tokyo Imperial Palace). It was moved there in 1604 by Tokugawa Ieyasa. In 1659 it was moved to its present location by his son Tokugawa Hidetada for use by the people of Tokyo. If the shrine feels new despite its impressive history its because its current buildings date to 1958 when it was rebuilt after WW2. 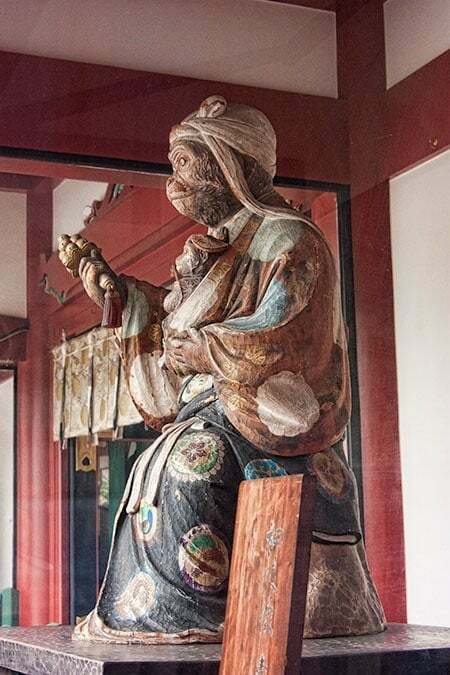 The Tokugawa shoguns and later Emperor Meiji continue to have an important connection with the shrine and have dedicated a number of historically significant weapons that can be viewed in the shrine museum although I don’t think they are all on display all of the time. One of the swords in now a National Treasure and 14 others including a pole weapon called a naginata are classed as important cultural assets. 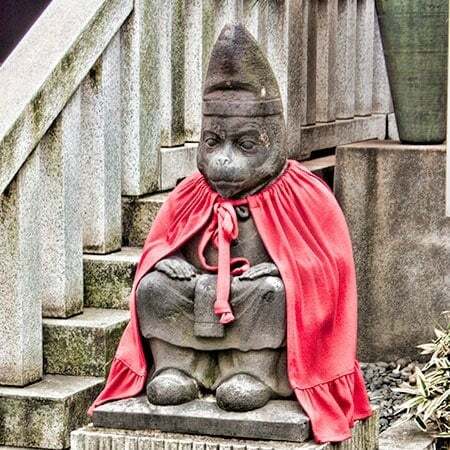 The main diety of the shrine is known as Oyamakui-no-kami or Sanno and is the Kami of Mt Hiei in Shiga Prefecture. 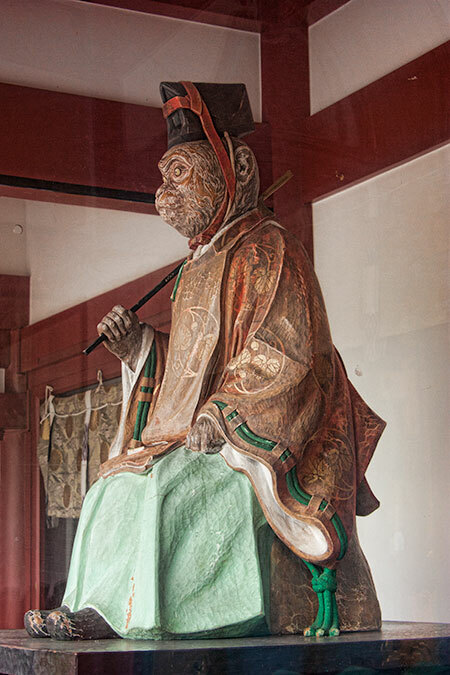 His messenger is the monkey which is why the monkey features heavily in this shrine in place of more common shrine animals such as the fox. 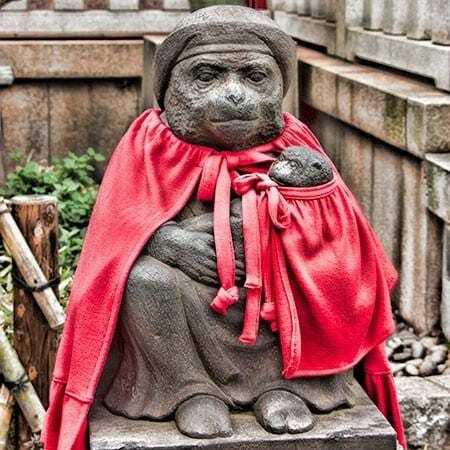 Masaru, the sacred monkey and protector stands as guardian at the main gate and with his family either side of the entrance to the main shrine. People will often come here to pray for a happy marriage and for fertility. Hie Jinja isn’t a large shrine or well known by tourists but it was a first ranked shrine that protected the city for many years. It continues to host of of Tokyos three most important festivals, the Sanno festival which is in the June of every even numbered year. It takes a full day for the 600 metre long procession of 300 participants in historical dress and portable shrines to cover the 20km round circuit and return to the shrine. In the Edo period the festival (matsuri) was distinguished by being allowed to pass through the grounds of Edo Castle. 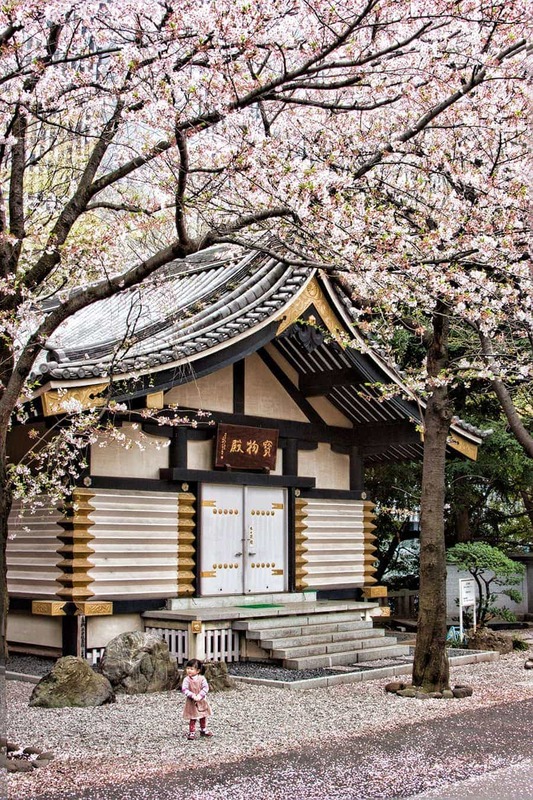 While Hie Jinja Shrine doesn’t have the drama of some others around the country its history is fascinating and having the opportunity to view it during cherry blossom season was a bonus. I have to admit to being a huge sakura fan. Everything just looks that little bit more special bathed in the pink petals. 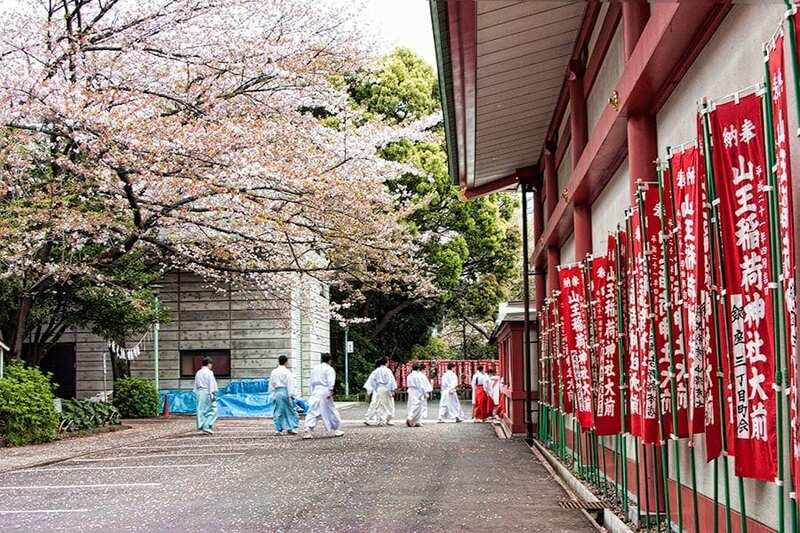 Hie Jinja Shrine is one of the most important shrines in Tokyo. Let me know if the comments if you have been there or seen the Sanno Festival? First off, your photos are amazing!!! And what an insightful piece! Thanks for sharing. Really nice to see the contrast of modern and ancient… This is the idea I have about Japan, and I definitely need to go there soon! You were so lucky to get the cherry blossom.. Amazing! Those cherry blossoms are just amazing! And I love how you have the best of both worlds so close together; the modern city and a centuries old shrine! Wait! I have been to Tokyo but not made it to that shrine! Shame on me… next time! Thanks for the tip. Tokyo is such a magical city. We went there for our honeymoon in April (five years ago!) and it was gorgeous with all the cherry blossom. That image of the girl under the cherry blossom tree is just gorgeous. Great post. Looks like an amazing place to escape without leaving the city. It looks so peaceful – not like something in the middle of a city. I love the last picture with the little girl there. And, I am deeply jealous! Thanks Fiona 🙂 You must be due some spring blossoms soon in the UK soon too. Have a happy weekend!